Adult steelhead have two very different physical appearances. Adult rainbow trout do not. In the ocean, and for a time after returning to freshwater, steelhead are bright silver in color with some irregular shaped spots on their back. They look very much like silver salmon, but are generally more bullet shaped. In freshwater steelhead turn darker in color. The color ranges from steely blue to olive green. They develop a bright red/pink cheek and lateral line that extends down the body. They also become heavily spotted with irregularly-shaped dark spots that extend along the body from the top of their head to the base of their tail, and from their backs down their sides past the lateral line. Once they have lost their silver color, steelhead, become very difficult to differentiate from their mature rainbow trout siblings. The Alaska record steelhead was a 42lb 3oz monster caught near Prince of Wales Island in 1970. Realistically, you can expect, to catch steelhead ranging from 20-34 inches and weighing 8-12 lbs. An 18-20 lb steelhead would be the fish of a lifetime. The primary distinguishing feature between rainbow trout and cutthroat trout is the lack of red slash on the bottom of their lower jaw. Steelhead and Rainbow trout spawn in the spring on shallow gravel beds of cold, clear-running streams and rivers. Eggs take anywhere from a few weeks to four months to hatch. After emerging from the gravel, the fry quickly grow into parr. The time spent as a parr varies but is generally about 3 years. At this point Rainbow Trout parr develop into mature trout and repeat the cycle. Steelhead, on the other hand, have a much more interesting life cycle. In April, they head for the mouth of the river turning into silver colored smolt. Smolt are the sea-going juvenile form of anadromous fish (fish that migrate from the ocean to freshwater to spawn). Once in the ocean where food is abundant, steelhead grow at an astounding rate of up to 1 inch every month! The smolt generally spend at least 2 years maturing in the ocean, before returning to their natal waters to spawn. Steelhead return to their natal waters either in the fall, where they over winter, or in the spring. Clear, cold streams and rivers. Ocean: Squid, small invertebrates, and other fish. Freshwater: Insects, eggs, salmon carcasses, mice, voles, and other small mammals. From Baja peninsula of Mexico up the Pacific Coast and across the Bering sea to the Kamchatka Peninsula of Russia. MORE INFO: See our post Best Tactics for Fishing Alaska’s Steelhead Trout for some prime tips for luring, hooking and landing one of southeast Alaska’s monster Steelhead. Best Fishing Dates: April to mid May, then October through November (just after the river thaws and just before it freezes again). Fly Rod: Most of Alaska’s rivers are fairly narrow (or the distance to the slot, at least, is not far), so you don’t need to be an expert long-distance fly caster to be successful fly fishing Alaska’s steelhead. If you’re fairly comfortable casting and fighting a fish on a fly rod, there’s nothing like landing a steelhead this way. An 9-11ft, 7-8wt fly rod with a good backbone is strong enough for you to safely land even the biggest steelhead yet flexible enough to let the rod do the work for you. Spinning Rod: If you’re not already familiar with fly fishing, a spinning rod set up is likely the best for you. A big trip, to a magical place, to in hopes of landing one of the most notoriously finicky fish is probably not the best time to add the challenge of learning to fly cast. A 8’ 6”, 8-12 lb, ¼-¾ oz, spinning rod is a great set-up. When using a spinning road, you’ll also use a float or strike indicator to suspend your terminal tackle in the water (unless you’re fishing with a spoon or diver). Steelhead are voracious, but discerning eaters. The key is to mimic their currently available foot sources as closely as possible. Eggs mimics are a great option in the fall because salmon are spawning. 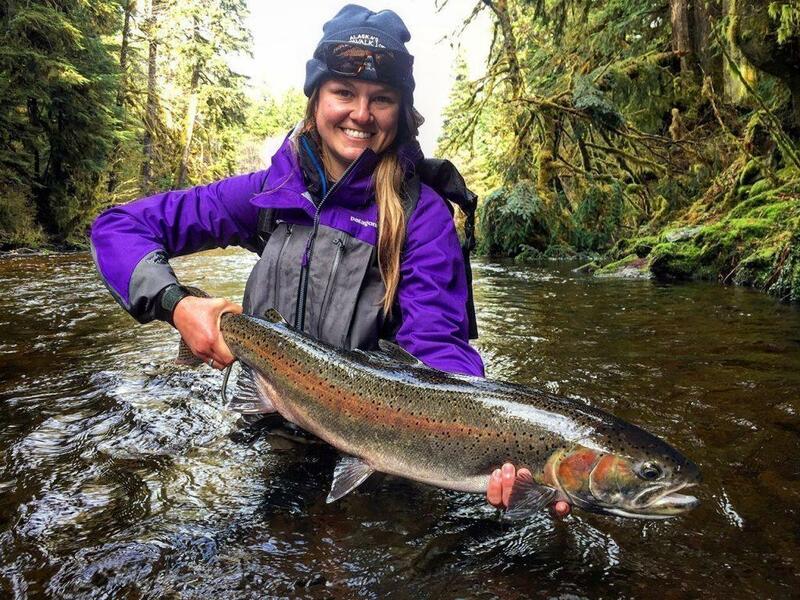 The guides at Alaska’s Boardwalk lodge know exactly when, where and how to fish the island’s steelhead runs (and all gear is included in your stay). That said, you can expect to fish some combination of the following. Streamers: Wooly buggers, Muddlers, and Egg-sucking leaches. If you’re curious, check out Orvis’s selection of Steelhead Flies. Yarn: Threading yarn through an egg loop and trimming up it to form a ball around the shank of the hook is a simple and, often very effective egg mimic for catching steelhead. Beads: As with yarn and egg patterns, beads mimic the appearance of a stray egg floating along the bottom of the river. Jigs: The big difference between jigs and flies, is that jigs are weighted at the top of the shank. This means that they will sink themselves without the need to add additional weight to the line. As before, they will be dressed to look like eggs or other tasty morsels. Eggs: Where allowed, these can be a steelhead’s favorite meal. Packed with nutrients and high in both fat and protein. Unfortunately, steelhead will often not just bite, but actually swallow eggs, making them a less friendly choice for catch-and-release fishing. Spoons: While it may seem “old fashioned” it can be very effective, especially for fish who’ve gotten savvy to every fly, jig, egg mimic out there. Spawned-out steelhead “kelts” return to the ocean exhausted, but very much alive and hungry. With the return to plentiful food in the ocean, they recuperate quickly. Adult steelhead may spawn annually, or skip years in between. Mature bucks are the most brightly color fish. There are no rainbow trout in the rivers and streams of Prince of Wales Island, so you can rest assured your steelhead, no matter how darkly colored, is indeed a steelhead. All POW steelhead are native fish; there are no stocked rivers in Alaska. Hens build their redds (nests) in open sunny spots on gravel beds. After laying her eggs and burying them, the hen will often stay and guard her nest. In the spirit of good stewardship and preserving the health of POW and all of Alaska’s native steelhead runs, please consider leaving these hens alone. NOTE: Steelhead fishing trips at Alaska’s Boardwalk Lodge are all-inclusive. We provide all the necessary gear, tackle, bait, licenses, stamps and tags required for your fully-guided sport-fishing adventure with us. Additionally, we stay up-to-date on all fishing regulations for our area including any daily emergency orders that may affect your fishing trip, so you don’t have to. WARNING: In terms of regulations, Alaska is one of the most confusing places to fish. Bag limits, fishing techniques, and even bait/tackle regulations, for any given fish species (except halibut) can vary from location to location. Depending on the body of water, and what species you are fishing, regulations can even change from day to day. Always be sure to check the regulations for every day and every area you fish. You, the angler, are responsible for knowing and following all fishing regulations including any daily changes released as emergency orders. You can find the emergency orders for Prince of Wales Island here. And for the rest of Alaska, you can select your region on this map.